So you think you’ve got problems! What is Farmer Brown to do when he finds out that his cows are typing him messages announcing that they will no longer produce milk unless he gives them electric blankets? It gets even worse when the hens declare that they, too, need electric blankets – or Farmer Brown will get no eggs. In the end, even the ducks get involved in this humorous book for primary students. 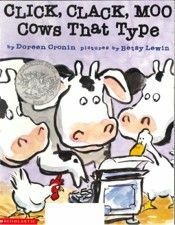 What special skill did Farmer Brown’s cows have? They were able to type! What economic wants did the cows have? They wanted electric blankets to keep themselves warm. The cows threatened not to produce milk if they didn’t get the electric blankets. Is milk an economic want? For people who want it to drink, use in cooking, etc. Next, the hens were cold and they also asked Farmer Brown for electric blankets! They threatened to not lay eggs. Are eggs an economic want? People who use them to eat, use in cooking, etc. Are milk and eggs an example of a good or service? At the end of the story, the ducks typed a note to Farmer Brown. What economic want did the duck have? Is a diving board a good or a service? In real life, how do people get the economic wants that they desire? People work to produce goods and services. People specialize in the goods and services they produce. They then trade with other people to get the economic wants that they desire.